Purpose: To summarize the characteristics of Adenoid Cystic Carcinoma (ACC) arising from nasopharynx by analysing 28 cases in a single center, in order to enhance the care of patients with these unusual neoplasms. Patients and Methods: This was a retrospective analysis of 28 patients with nasopharyngeal ACC who were treated in Huai’an cancer hospital between 1997 and 2011. Kaplan-Meier estimation was used to calculate Overall Survival (OS). Results: Most patients had locally-advanced lesions at the time of diagnosis. The most common presenting complaints were nasal obstruction and blood-stained snot. The peak incidence of the patients in our study is the 5th decade. In this study, 11 of 28 patients received radical surgery, and the rest received non-surgery treatment (chemoradiotherapy or radiotherapy alone). The 5 y OS rate in surgical treatment group was higher than in nonsurgical treatment group (100% vs. 47.1%) and the survival curves showed OS in surgical group was better than that in non-surgical group (χ2=3.844, P=0.05). Conclusion: Adenoid Cystic Carcinoma (ACC) in the nasopharynx is an extremely rare entity. Surgery followed by postoperative radiotherapy is the main stay of treatment. Locally advanced patients may also benefit from surgical treatment. Our data showed that treatment approach was an important factor affecting the prognosis. Adenoid cystic carcinoma, Radiotherapy, Surgery, Treatment. Adenoid Cystic Carcinoma (ACC) is an uncommon malignant tumor, accounting for 3-5% of all neoplasms of the head and neck and approximately 22% of all salivary gland cancers [1-3]. ACCs are rare variants of adenocarcinoma that most frequently arisen from major salivary glands included the parotid, submandibular, sublingual salivary glands, and minor salivary glands, which were located within the upper aerodigestive tract . As demonstrated in the previous studies, ACC is most commonly found in the palate, followed by the paranasal sinuses and other sites of the oral cavity, while it’s rarely found in the nasopharyngeal cavity. Because previous studies have shown that primary nasopharyngeal adenocarcinoma (including ACC) represents less than 0.48% of all types of nasopharyngeal cancers [5,6]. In 1859, Billroth was first described this tumor as the term cylindroma. Subsequently, the current name of ACC introduced by Spies has gained general acceptance . ACC has a distinct propensity for frequent early Perineural Invasion (PNI), and late haematogenous distant metastasis, while rarely spread to the lymph nodes. Furthermore, this tumor has a strong tendency to local invasion, which undoubtedly increases the difficulty of radical resection [2,8-12]. In general, planned combined surgery and radiation therapy is the accepted standard of care for minor salivary gland malignancy. Some studies revealed that the lesions in the nasal cavity or maxillary sinus were generally discovered at a late stage at the time of diagnosis, which increased the difficulty of surgery or even lost the chance of surgery [13,14]. ACC stands for a special diagnostic and therapeutic challenge due to its extraordinary nature. This study aimed to review our long-term experience based on the study of twenty-eight patients with nasopharyngeal ACC in the light of the most recent knowledge based on a review of the literature. After obtaining the approval of the institution’s research ethics board, we performed a single-center retrospective analysis of 28 patients with nasopharyngeal ACC treated in Huai’an cancer hospital during Jan 1997 through Dec 2011. A total of 9,680 patients with nasopharyngeal malignancy were treated in our hospital, only 28 patients were diagnosed with primary nasopharyngeal ACC (28/9,680, 0.29%). All patients were confirmed by biopsy or postoperative pathology and restaged according to the 2009 the sixth edition of American Joint Committee in Cancer (AJCC) classification system. Because our study is a small sample data, T4A and T4B tumors were grouped together as T4 in statistics for the purpose of analysis. All participants provided written informed consent. Follow-up information obtained from admission and outpatient records or by telephone call. The date of last follow-up was Dec 2016. OS was calculated from the beginning of treatment to the date of last follow-up or death from any cause. Statistical analyses were performed with the Statistical Program for Social Sciences (SPSS) for Windows version 20.0 (SPSS Inc., Chicago and IBM). The Kaplan-Meier method was used to construct the OS survival curves for the sites. A pvalue <0.05 was considered statistically significant. In the entire cohort, 14 (50.0%) were male and 14 (50.0%) were female. The median age was 47 y (range 28-70 y). None of the patients had evidence of distant metastasis at time of diagnosis. According to the AJCC 2009 criteria, the majority of patients (75.0%) had advanced T stage (T3, T4). 7 patients (25.0%) belonged to the T2 stage, and no T1 stage was observed in the current study. 4 of 28 (14.3%) patients presented lymph node metastases at admission, one patient was classified as N1 and three patients was classified as N2. Two N2 patient received extended resection of nasopharyngeal lesions and also underwent selective bilateral cervical lymph node dissection, with R1 resection of pathologically confirmed. The patient’s characteristics are listed in Table 1. The type and extent of surgery were dependent on specific site of the lesion, surgeon’s clinical judgment and patient’s willingness to undergo resection. In this study, 11 of 28 (39.3%) patients (4 T2, 5 T3 and 2 T4) received nasopharyngectomy with a curative intent. For the patients undergoing surgery, 9 patients received combined modality therapy consisting of surgery combined with radiotherapy or chemoradiotherapy and 2 patient received surgery alone. The rest of the patients received non-surgical treatment (14 patients received concurrent or sequential chemoradiotherapy and 3 patient had received radical radiotherapy alone). Of the 28 patients, 23 patients received a median four cycles (range from one to six cycles of combined cisplatin and fluorouracil) of palliative chemotherapy. Patients received radiation therapy which was used three-dimensional (3D) treatment planning excepting for 2 patient who received surgery alone. The median prescription dose of the lesions and high areas was 66 Gy (range, 50-80 Gy). Elective radiotherapy to the neck was given in 61.5%, and with a median 50 Gy prescription dose. All patients enrolled have been followed for at least 5 y. The median OS was 6.8 year (3.4-10.4 y). The 5 and 10 y OS rates were 67.9% and 10.7%, respectively. The 5 and 10 y OS in surgery group were 100% and 27.3%, respectively. The 5 and 10 y OS in non-surgery group were 47.1% and 0%, respectively. Follow-up inspections indicated that 19 of 28 (67.9%) patients developed locoregional or distant failure: four patients had locoregional recurrence alone, twelve patients had merely distant metastasis, and three patients had both locoregional and distant failure. The most common sites of distant recurrences were lung (n=9), followed by bone (n=3), brain (n=1) and liver (n=1). Note that patients may have metastases to more than one distant site. In 21 cases (75.0%), tumors had invaded the skull base at the time of initial diagnosis. Our data revealed that patients in surgical treatment group had a better survival, compared with those in nonsurgical treatment group (χ2=3.844, P=0.05). (Figure 1). Figure 1: Overall survival curve. 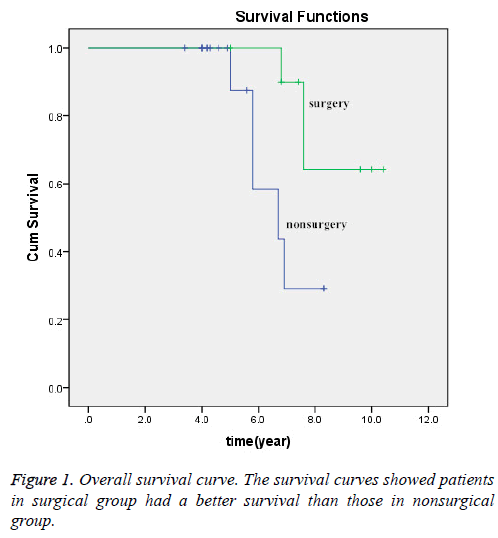 The survival curves showed patients in surgical group had a better survival than those in nonsurgical group. ACC is an uncommon malignant tumor. Several reports in recent years have occasionally shown ACC originates from other than the common sites such as cardia, breast, lung, esophagus [15-18]. While the primary site of the nasopharynx is exceedingly rare. The vast majority of nasopharyngeal carcinomas are keratinizing or non-keratinizing squamous cell carcinoma. Primary nasopharyngeal adenocarcinomas (included ACC) as a group are reported to occupy 0.48% in all types [5,6]. ACC is a tumor of an uncertain age. Not only the old but also the young can be involved. The peak incidence of the patients in our study was the fifth decade (47 y), which was similar to most studies in the literature [19-21]. Controversial also exists about the ratio of male to female. A meta-analysis by Martin- Rodriguez and the colleagues revealed that ACC was found to be more common among women . While, our data revealed that there is no gender predominance between man and woman. Nasopharyngeal ACC was a rare malignancy with special biological features, which has different treatment strategies compared with the common nasopharyngeal cancers. The benefit of concomitant chemoradiotherapy for squamous and poorly differentiated cancers of head and neck has been proven. However, the clinical effort for locally advanced or inoperable salivary gland carcinomas is poorly understood. Taking its indolent clinical behaviour into consideration, surgery does represent a potential treatment option for the lesion. ACC also has distinct propensities for frequent early perineural invasion, local invasion and late haematogenous distant metastases, which is considered to be high-grade malignancy and should be treated with combined-modality therapy. Some efforts have been made on the optimal treatment approaches for patients experienced with nasopharyngeal ACC. Nasopharyngeal malignancies, no matter what kind of pathological types, often faced with a common problem that patients often present without local symptoms. In addition, ACC is characteristic by slow and insidious growth, often discovered at a late and locally advanced stage, as our results have described above [2,8-12]. Radical surgical resection is the main stay of treatment for early nasopharyngeal ACC. However, advanced lesions in the nasopharynx basically lost the chance of surgery. Even so, Schramm and Imola study revealed that patients with locally advanced stage can also benefit from surgical treatment . They enrolled 23 patients presenting with T3-T4 salivary gland malignancies in the nasopharynx who received surgical resection and radiotherapy (6 patients received preoperative radiotherapy and 17 patients received postoperative radiotherapy). The outcomes were as follows: the 5 and 10 y disease free survival rates were 67% and 48%, respectively, and the 5 y local control rate was 77%. A retrospectively study conducted by Iseli et al. reviewed 183 patients with ACC, revealed that the 10 y local recurrence-free survival rate of radiotherapy alone was significantly worse (0%), compared with surgery alone (41.8%, P=0.002) and surgery followed by postoperative radiotherapy (43.5%, P=0.001) . In the present study, our data revealed that the 5 y OS rate in surgical treatment group was higher than in nonsurgical treatment group (100% vs. 47.1%; χ2=3.844, P=0.05), which mainly because the small number of cases failed to highlight the advantages of the operation. In addition, what should to be mentioned was that patients receiving radiotherapy alone were more likely to have the lesions in the primary sites of pharyngeal or hypopharyngeal. In addition, many studies reported in the literature are recommended surgery followed by postoperative radiotherapy for the management of ACC [25-27]. Posteroperative Radiotherapy (PORT) was mainly applied to patients with poor prognostic factors. Miglianico et al. in a retrospective study revealed that patients in PORT group had a higher 5 y locoregional control rates (78% vs. 44% for surgery alone, p<0.01) . However, the improvement in locoregional control did not result in improving the survival rates after undergoing PORT: 5 y disease-free survivals were 49% for surgery alone and 54% for PORT (p=not significant), and 5-year overall survival was 83% for surgery alone and 72% for PORT (p=not significant), respectively. Because of the small number of cases in this study, it is difficult to compare surgery alone with surgery plus radiotherapy. In the present study, 21 of 28 (75.0%) patients were in advanced stage at the time of diagnose. However, only 39.3% patients received surgical treatment, and the rest received nonsurgical treatment. The 5 and 10 y OS in non-surgery group were quite poor compared with the patients in surgery group. Our data showed that the 10 y OS rates in nasopharyngeal ACC were lower than those reported in the literature, which mainly cause by the advanced stage was considered medically unfit for surgery or patients refused surgery. Another reason could explain the poor prognosis of nasopharyngeal ACC, as the outcome described above. Because the lesion in the nasopharynx was proximity to surrounding essential structures such as the parapharyngeal space, skull base, cranial nerves, paranasal sinus, orbit or infratemporal fossa, there is a need to balance functional and cosmetic with oncologic consequences. The complex anatomy undoubtedly increased the difficulty of surgery, interfered with a complete surgical resection and even lost the chance of surgery. Previous reports have also indicated that tumors arising closer to the base of the skull, such as nasopharyngeal ACC, have worse outcomes, which resulted in low local control rate. Cervical lymph node status is an important prognostic predictor for salivary glands tumors. Recent and past studies are consistent in revealing a reduced survival in patients with positive lymph node at time of primary therapy, and the 5 y survival rate was significant different with or without cervical lymph node metastasis (44-48% vs. 73-77%) [28-30]. In spite of the low lymph node metastasis rate of ACC, for patients with clinically positive cervical lymph node, therapeutic neck dissection is still strongly recommended at the time of primary surgery followed by adjuvant RT, regardless of histology or site . In our study, four patients had clinical or radiologic evidence of cervical node metastasis, however, only one patient accepted neck dissection with the evidence of metastatic ACC, the other three patients received radiotherapy. This may be another reason for relatively low survival. ACC in the nasopharynx is an extremely rare entity and continues to pose diagnostic and therapeutic challenges to physicians due to its biological behaviour. Surgery followed by postoperative radiotherapy may be the mainstay treatment, especially for patients presenting with early stage disease. Radiotherapy alone was used if the primary was considered unresectable, or if the patient refused surgery or was considered medically unfit for surgery. Our data showed that treatment approach might be an important factor affecting the prognosis of patients with advanced the nasopharyngeal ACC. This study was supported by the [funding Agency 1: 333 highlevel personnel training project funded research projects of Jiangsu Province] under Grant [number: BRA-2014131]; [funding Agency 2: Social development and scientific research from Jiangsu Province] under Grant [number: HA2013032]. Bradley PJ. Adenoid cystic carcinoma of the head and neck: a review. Curr Opin Otolaryngol Head Neck Surg 2004; 12: 127-132. Amit M, Binenbaum Y, Sharma K. Adenoid cystic carcinoma of the nasal cavity and paranasal sinuses: a meta-analysis. J Neurol Surg B Skull Base 2013; 74: 118-125. Fitzpatrick PJ, Theriault C. Malignant salivary gland tumors. Int J Radiat Oncol Biol Phys 1986; 12: 1743-1747. Lloyd S, Yu JB, Wilson LD, Decker RH. Determinants and patterns of survival in adenoid cystic carcinoma of the head and neck, including an analysis of adjuvant radiation therapy. Am J Clin Oncol 2011; 34: 76-81. He JH, Zong YS, Luo RZ, Liang XM, Wu QL, Liang YJ. Clinicopathological characteristics of primary nasopharyngeal adenocarcinoma. Ai Zheng 2003; 22: 753-757. Guo ZM, Liu WW, He JH. A retrospective cohort study of nasopharyngeal adenocarcinoma: a rare histological type of nasopharyngeal cancer. Clin Otolaryngol 2009; 34: 322-327. Kim KH, Sung MW, Chung PS, Rhee CS, Park CI, Kim WH. Adenoid cystic carcinoma of the head and neck. Arch Otolaryngol Head Neck Surg 1994; 120: 721-726. Garden AS, Weber RS, Morrison WH, Ang KK, Peters LJ. The influence of positive margins and nerve invasion in adenoid cystic carcinoma of the head and neck treated with surgery and radiation. Int J Radiat Oncol Biol Phys 1995; 32: 619-626. Kokemueller H, Eckardt A, Brachvogel P, Hausamen JE. Adenoid cystic carcinoma of the head and neck-a 20 year experience. Int J Oral Maxillofac Surg 2004; 33: 25-31. Wiseman SM, Popat SR, Rigual NR. Adenoid cystic carcinoma of the paranasal sinuses or nasal cavity: a 40-year review of 35 cases. Ear Nose Throat J 2002; 81: 510-514. Balamucki CJ, Amdur RJ, Werning JW. Adenoid cystic carcinoma of the head and neck. Am J Otolaryngol 2012; 33: 510-518. Lupinetti AD, Roberts DB, Williams MD. Sinonasal adenoid cystic carcinoma: the M. D. Anderson Cancer Center experience. Cancer 2007; 110: 2726-2731. Garden AS, Weber RS, Ang KK, Morrison WH, Matre J, Peters LJ. Postoperative radiation therapy for malignant tumors of minor salivary glands. Outcome and patterns of failure. Cancer 1994; 73: 2563-2569. Goepfert H, Luna MA, Lindberg RD, White AK. Malignant salivary gland tumors of the paranasal sinuses and nasal cavity. Arch Otolaryngol 1983; 109: 662-668. Zhou Y, Zang Y, Xiang J, Tang F, Chen Z. Adenoid cystic carcinoma of the cardia: Report of a rare case and review of the Chinese literature. Oncol Lett 2014; 8: 726-730. Miyai K, Schwartz MR, Divatia MK. Adenoid cystic carcinoma of breast: Recent advances. World J Clin Cases 2014; 2: 732-741. Elnayal A, Moran CA, Fox PS, Mawlawi O, Swisher SG, Marom EM. Primary salivary gland-type lung cancer: imaging and clinical predictors of outcome. AJR Am J Roentgenol 2013; 201: 57-63. Sawada G, Moon J, Saito A. A case of adenoid cystic carcinoma of the esophagus. Surg Case Rep 2015; 1: 119. Ellington CL, Goodman M, Kono SA. Adenoid cystic carcinoma of the head and neck: Incidence and survival trends based on 1973-2007 Surveillance, Epidemiology, and End Results data. Cancer 2012; 118: 4444-4451. Khan AJ, DiGiovanna MP, Ross DA. Adenoid cystic carcinoma: a retrospective clinical review. Int J Cancer 2001; 96: 149-158.
da CPDE, Pires FR, Lopes MA, de Almeida OP, Kowalski LP. Adenoid cystic carcinoma and mucoepidermoid carcinoma of the maxillary sinus: report of a 44-year experience of 25 cases from a single institution. J Oral Maxillofac Surg 2006; 64: 1592-1597. Martinez-RN, Leco-BI, Rubio-AL, Arias-IO, Martinez-GJM. Epidemiology and treatment of adenoid cystic carcinoma of the minor salivary glands: a meta-analytic study. Med Oral Patol Oral Cir Bucal 2011; 16: 884-889. Schramm VL, Imola MJ. Management of nasopharyngeal salivary gland malignancy. Laryngoscope. 2001; 111: 1533-1544. Iseli TA, Karnell LH, Graham SM. Role of radiotherapy in adenoid cystic carcinoma of the head and neck. J Laryngol Otol 2009; 123: 1137-1144. Armstrong JG, Harrison LB, Spiro RH, Fass DE, Strong EW, Fuks ZY. Malignant tumors of major salivary gland origin. A matched-pair analysis of the role of combined surgery and postoperative radiotherapy. Arch Otolaryngol Head Neck Surg 1990; 116: 290-293. Storey MR, Garden AS, Morrison WH, Eicher SA, Schechter NR, Ang KK. Postoperative radiotherapy for malignant tumors of the submandibular gland. Int J Radiat Oncol Biol Phys 2001; 51: 952-958. Miglianico L, Eschwege F, Marandas P, Wibault P. Cervico-facial adenoid cystic carcinoma: study of 102 cases. Influence of radiation therapy. Int J Radiat Oncol Biol Phys 1987; 13: 673-678. Feinstein TM, Lai SY, Lenzner D. Prognostic factors in patients with high-risk locally advanced salivary gland cancers treated with surgery and postoperative radiotherapy. Head Neck 2011; 33: 318-323. Amit M, Binenbaum Y, Sharma K. Incidence of cervical lymph node metastasis and its association with outcomes in patients with adenoid cystic carcinoma: An international collaborative study. Head Neck. 2015; 37: 1032-1037. Min R, Siyi L, Wenjun Y. Salivary gland adenoid cystic carcinoma with cervical lymph node metastasis: a preliminary study of 62 cases. Int J Oral Maxillofac Surg 2012; 41: 952-957.